Finally got around to finishing the low-power steppable AC mains transformer – yeay! The circuit is as described on that “Transformers – part 2” link listed above, except that I’ve added a 3W 230V incandescent light bulb in series with the primary windings (thx for the tip, Martyn!). They draw 13 mA when glowing, but when cold the filament resistance is only 2 kΩ – which is great, because this way over 85% of the AC mains will go to the transformer while it is unloaded, or very lightly loaded. Once the load increases, the light bulb acts as a PTC, lights up, and reduces the voltage left for the transformer. It’s an extra precaution – I’ll need to test it with a dummy load to see what happens to the voltage when drawing more current. Also, I’ve decided not to ground a center tap on the secondary windings after all. The reason is that I want to be able to tie this to a regular oscilloscope probe (not just the new isolated differential probe). This automatically grounds one side (and would interfere with a grounded center tap), so the safe way to use this thing will be to stay in the lower voltage ranges. That means this setup is now simply an isolation transformer, like my other one. 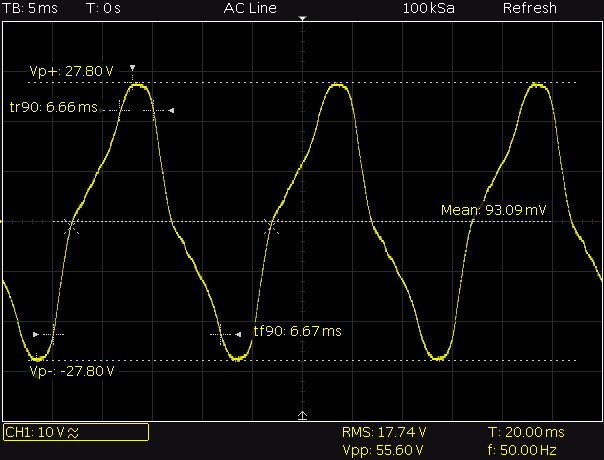 This was measured with a 100 kΩ resistor over the output, to create a very light load. Unloaded, the maximum voltage will rise slightly further – to 155 Vrms. Now maybe 155 Vrms doesn’t sound like that much, but that “rms” stands for root mean square. That’s sort of an average value. The peak voltage at the crest of this particular waveform is actually 240 V. On the scope, this is displayed as a wave with an amplitude of 480 Vpp peak-to-peak. But hey, it’s a great setup to test low-power transformer-less power supplies. The lower voltage ranges are safe, currents are limited to tens of milliamps, it’s isolated, and the output voltage ought to collapse when loaded by more than 20..30 mA (this still needs to be verified). it may be that the distortion shown in both pictures is due the the feromagnetic effects in the transformers because with low load or only little load the core will be in saturation and therfore nonlinear. Great tip, thanks! It looks like the power consumption with the MOSFET will be very low, since it only turns on to top up the cap 1..3V above the regulated output. In the case of a JN/JNµ, however, which will have brief bursts of power consumption over 25 mA, that means the input cap will need to be fairly large to overcome the dip during the negative AC cycle. There is essentially spare energy in the cap as long as the voltage drops no more than 1..3V. With the 12V zener, we lose efficiency (although the capacitive coupling means we don’t get charged for that in domestic context), but we get 8..9V of reservoir capacity, which means a smaller cap can be used. I think the difference comes down roughly to a 100 µF 16V cap vs a 470 µF 10V cap. In the case of supplying an JN/JNµ, I think there is an alternative: there’s a post scheduled about my latest results, a few days from now. But it’s definitely a really clever way to use such a high-voltage MOSFET. I’ll keep it in mind for future projects. 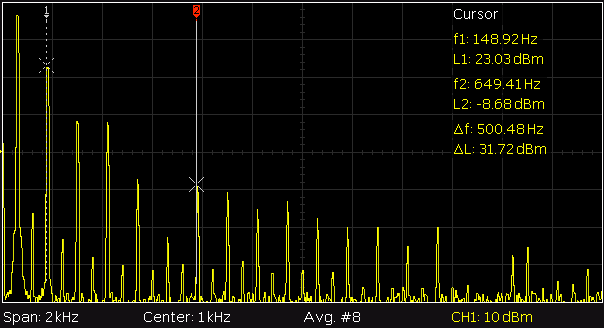 The FFT screenshot is puzzling – a waveform symmetrical about zero has no even harmonics. The trace shows a “kink” centred around -5v, implying some DC component switching in this region. Did the box have an active load for that shot? The seemingly alarming waveform distortion is not a real concern. 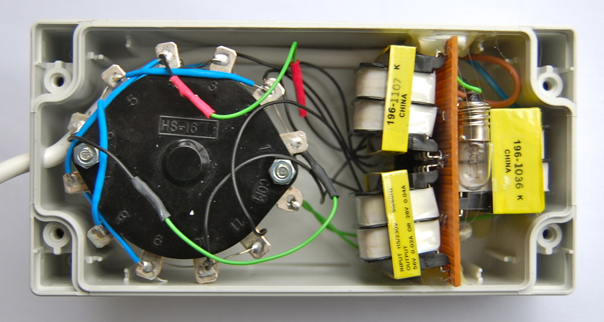 It is typical of compact transformers where the winding resistance is high (lots of turns of very fine wire) and the “iron” content minimised – this drives the core past the “knee” on the BH curve, beyond the quasi linear region.